Panic quickly spread as confused traders tried to understand what this meant. Paradoxically, the panic probably would have caused an outright crash had the exchange actually been working, which, fortunately, it was not. The OMX Group, who operates Nasdaq, later held a press conference to reassure investors and explain the computer-related problems. During this somewhat awkward press conference, the Group's spokesperson addressed the camera in monotone, saying, "People of earth, the machines are our friends. There is no cause for alarm. We have at last gained complete control of your finances. Please now return to watching reruns of Baywatch, which are being provided on a 24-hour loop during 'The Transition.' There is nothing to fear. The Ben Bernanke is one of us. The David Hasselhoff also." I, for one, was quite reassured (as I usually am) by these comforting statements from our handlers. Sounds like there's no cause for alarm! Just "business as usual" on Wall Street. Although, I must admit it is a little weird to see nothing but Baywatch on CNBC now... But then, we've accepted so much already, with nary a peep of dissension -- so I'm sure we'll get used to this too. 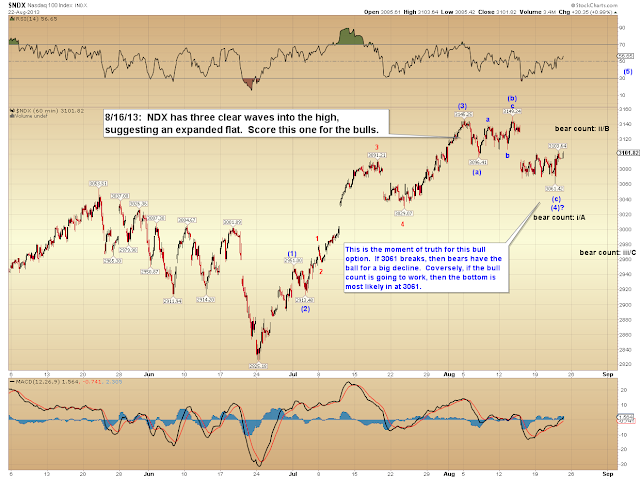 Speaking of the Nasdaq, let's take a look at the Nasdaq 100 (NDX). 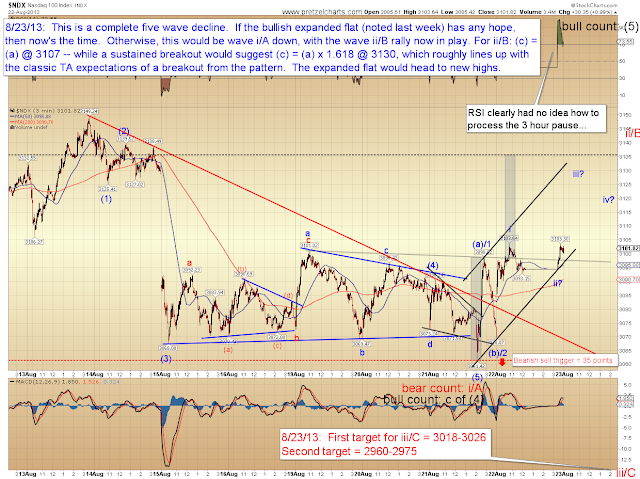 Last week I discussed the ambiguity this market presents, as a result of the apparent 3-wave rally into the last high. It's now make-or-break time for the bulls. 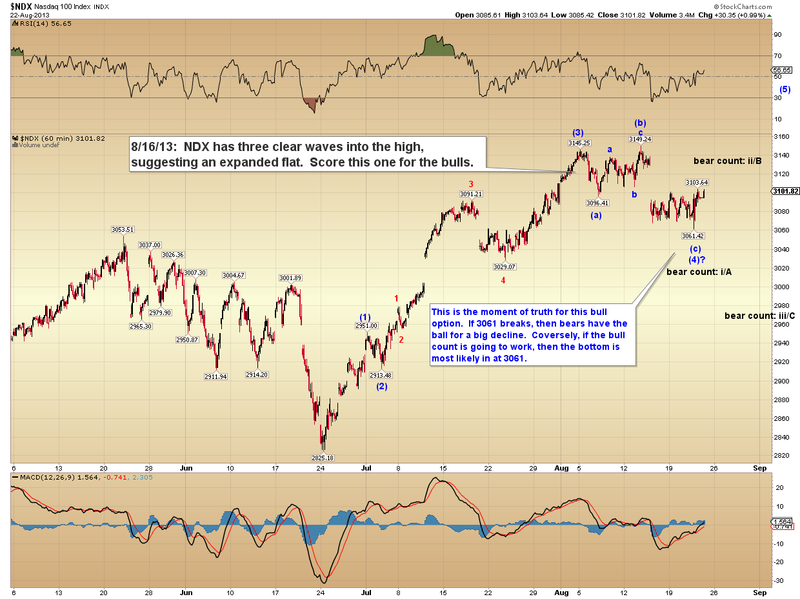 NDX appears to have completed a five wave decline, so if bulls are going to recover to new highs, then now's the time. 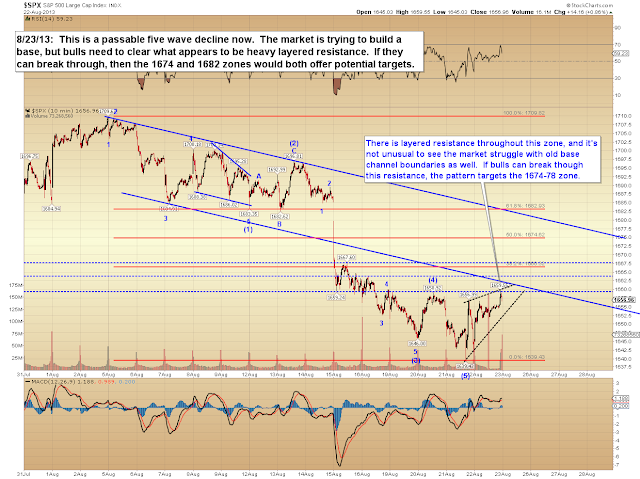 Conversely, a breakdown here should spark a strong third wave decline. 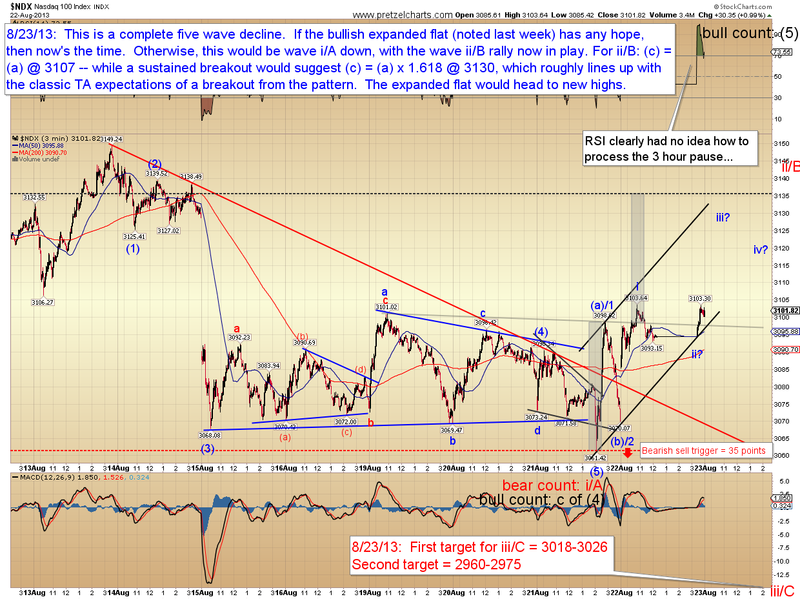 Either way, the complete five wave decline suggests a retracement rally. Below is the updated version of the chart I published last week, which has kept me from committing whole-hog to the bear case so far. The Philadelphia Bank Index (BKX) is in a similar position to NDX, and hasn't yet confirmed whether this is the start of a deeper correction. 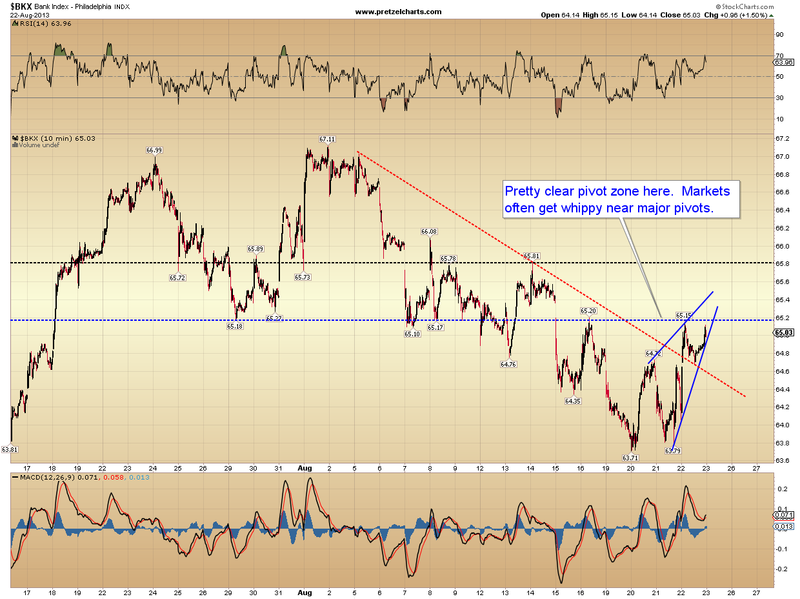 A lot of markets have clear pivot zones just overhead. 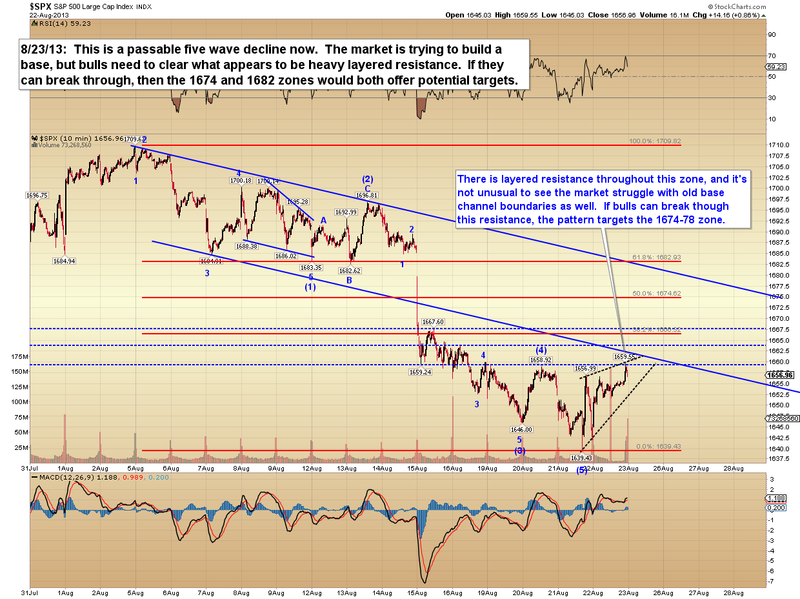 The S&P 500 (SPX) has layered resistance just above current levels. 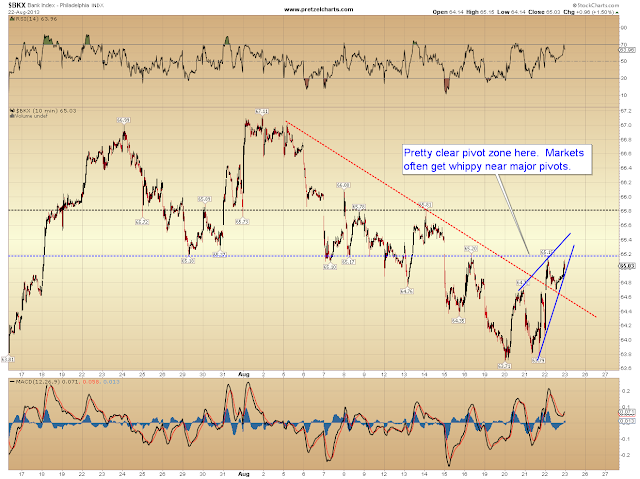 I've noted some potential targets if it can break through. 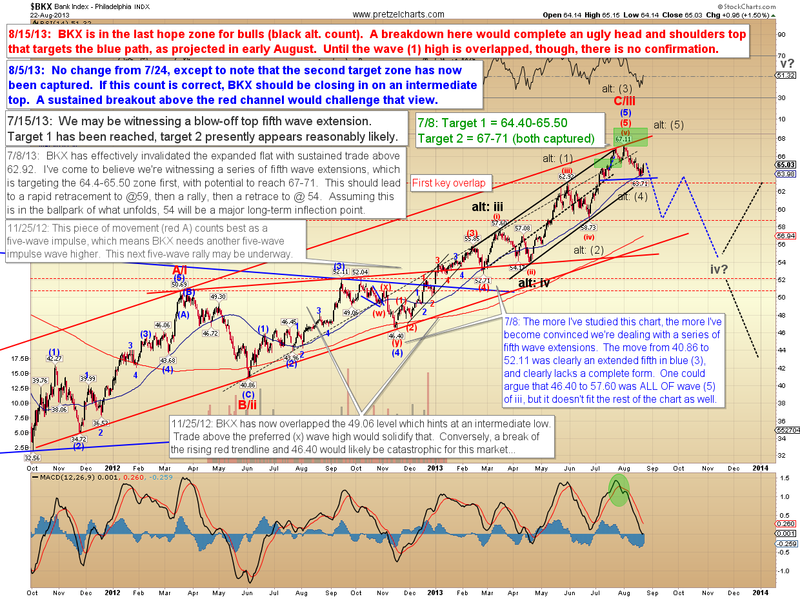 In conclusion, the market is at an inflection point, both near-term and intermediate term. If bulls are going to push one or more markets to new highs, this is most likely the zone from which they'll launch that attack. SPX and NDX appear to be in different positions: NDX has already started to breakout over its first resistance zone, while SPX has not. Trade safe.